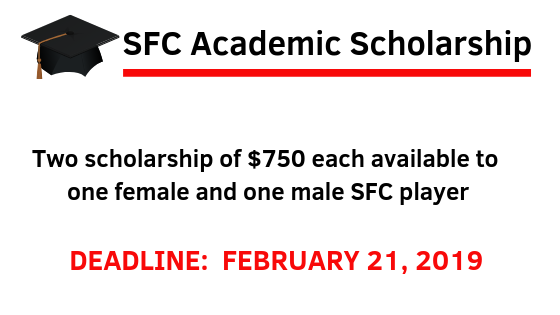 The SFC Academic Scholarship Awards program has been created so that we may recognize graduating high school players who have made significant contributions to their community, school, and or SFC. A candidate that is registered to a current SFC team. A candidate that was registered to SFC team in the previous year or years. A candidate that has done volunteer work within SFC or in the community (reference letter required). A student enrolled in Grade 12 (or equivalent) during the current year. A student who has been accepted and is confirmed for studies at an accredited Canadian post-secondary institution commencing September 2019. The student must present proof of post-secondary school registration before the scholarship can be awarded. To apply for the scholarship, you must complete and submit the application form available below.